Sometimes moments take your breath away. I was walking briskly through Santa Fe, taking a break from the Two Sisters Quarterly Summit at an adorable outdoor café. Catherine and I had been working there all day, and I needed to stand, stretch, and move. After striding past open air markets featuring beautiful bright Native American blankets, beaded jewelry, and turquoise, I headed down a narrow street lined with unique shops. Suddenly colorful lights drew my attention. I turned to look through the window. Mouth gaping. Tears filling my eyes. I beheld the indescribably beautiful Turkish style lantern chandeliers dangling from the ceiling. Some are emerald green, some are multi-colored, some are purple, some are silver. They are all breathtaking. I love Moroccan, and have been searching for just the right lantern-style lights for years. “I should put a camera to take pictures of people when they walk in and react like that,” said Carrie, who works there. I was so overwhelmed, my whole body was trembling and tears filled my eyes. “What’s the name of this store?” I asked. I looked around more after taking pictures that don’t do it justice. I FaceTimed my mother back in Michigan, so she could see this spectacular display of light, glass, and metal. I left, dashing back to resume the Two Sisters meeting with Catherine, who called as I walked, concerned that I had gotten lost. Yes, I was lost in a magic moment! I savored it deeply, making an imprint on my soul, lighting me up inside. 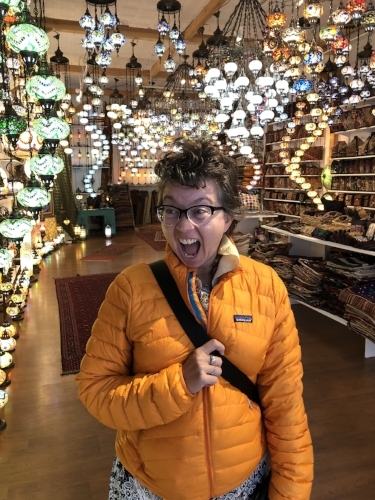 The next day, when I needed another break from our intense work, I dashed back to Magic Art, and met the owner as the jewel-toned lamps enchanted me. He said the lamps are actually from Istanbul, Turkey. I stayed as long as possible, absorbing the absolute bliss of beholding these glowing balls of light. It was pure magic! May you find some magic moments today, and enjoy them deeply. Catherine’s expression after she stepped into Magic Art.